So I obviously had to pick this band for my first album review as i probably can't go a day without listening to them, and if you're a friend of mine then i've probably succeeded in converting you into a fan throughout the past year. I first heard of these 4 Aussie guys back in 2013 when one of their members followed me on twitter and with him being verified, I obviously took an interest and decided to check them out on YouTube. I heard a track called "Heartbreak Girl" which was insanely catchy and they also happened to be supporting One Direction who i was coincidentally seeing in concert the week after. These guys are great live, and I've probably seen them around 5 times now, and it's been amazing to have been able to meet them and speak to them on twitter before they took the world by storm. 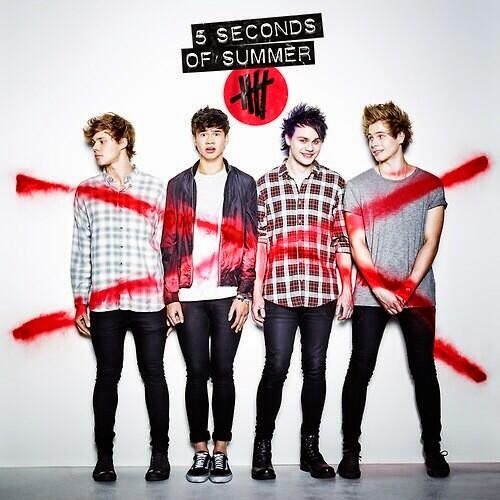 So their Self-Titled album "5 Seconds of Summer" was released in June 2014, following a series of EPs. Now i'm sure you've all heard their tracks "She Looks So Perfect" and "Don't Stop" in shops, on the radio, at a kebab shop at 3am on your way home, and sure they're catchy, but I've heard a lot of people say "they're too pop for me" etc. BUT their whole album gives more of a pop rock vibe, and they've worked with artists such as Alex Gaskarth (All Time Low), Scouting for Girls and the Madden brothers (Good Charlotte) on some of the tracks. So from a completely unbiased view I've tried to pick my favourites on the album (judging by my iTunes play count) so if you haven't heard of them you can kinda just listen to these and make your mind up for yourself. She Looks So Perfect - perfect addition to your pre-drinks playlist, but please don't try and reenact the music video. Everything I Didn't Say - relatable, catchy, relatable. End Up Here - play this on blast in your car, it will have you singing "YOU SAID YOU LIKED MY COBAIN SHIRT" at the top of your lungs. Long Way Home - one of those songs you just wanna smile through. English Love Affair - saucy, probably about me. Close as Strangers - anyone who's been in a long distance relationship will get major feels, and Luke Hemming's voice is just heaven. VooDoo Doll - full of sassiness, fell in love with this song the first time i heard it live. If You Don't Know - this isn't actually on the album but on their Don't Stop EP but it's a slow, deep song that most people can relate to if you've been in a relationship. I unconsciously used one of their lines when having an intense phone conversation with someone, so if you're reading this and hear this song, my bad. Having heard most of these songs live before the album came out made it even more exciting to finally hear studio versions without screaming fans in the background via YouTube. Anyone who's interested in seeing them there are currently still tickets available for their 2015 "Rock Out With Your Socks Out" headline tour.